Scott Rothstein, who profiled my work last year on his excellent blog Art Found Out, has just published a short piece about my silhouette imagery for the online arts journal Hand/Eye. 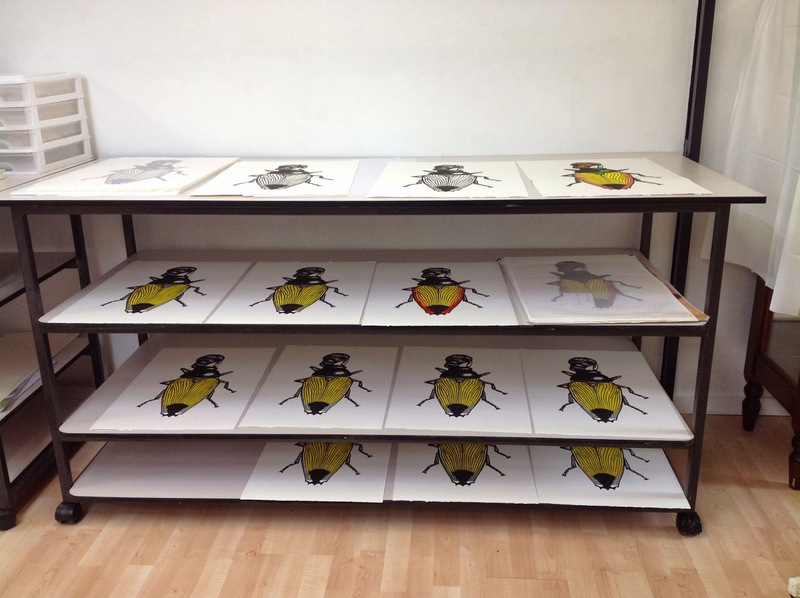 His article focuses particularly on the one-of-a-kind artist books, including the series Tall Tales. Scott's article, In Silhouette - Deborah Klein's diverse and eclectic paper art, can be read HERE. The publication of the article is timely, as I have been invited to exhibit a selection of these and other book art in Biblio, the artist book section of this year's Clunes Booktown on the weekend of 3-4 May. Over the past few weeks I've been doing a great deal of advance preparation, because on Friday my partner Shane Jones and I will be winging our way to London for a month. We are scheduled to return just three days before Booktown begins. 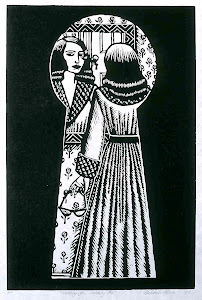 The Shadow Women, The Shadow Women 2 and Shadowomen 3, 2014, zines, laser printed, 10.5 x 7.5 cm (closed). For more detailed information about Clunes Booktown and the new zines, visit Moth Woman Press HERE. It wasn't about which political side you were on. 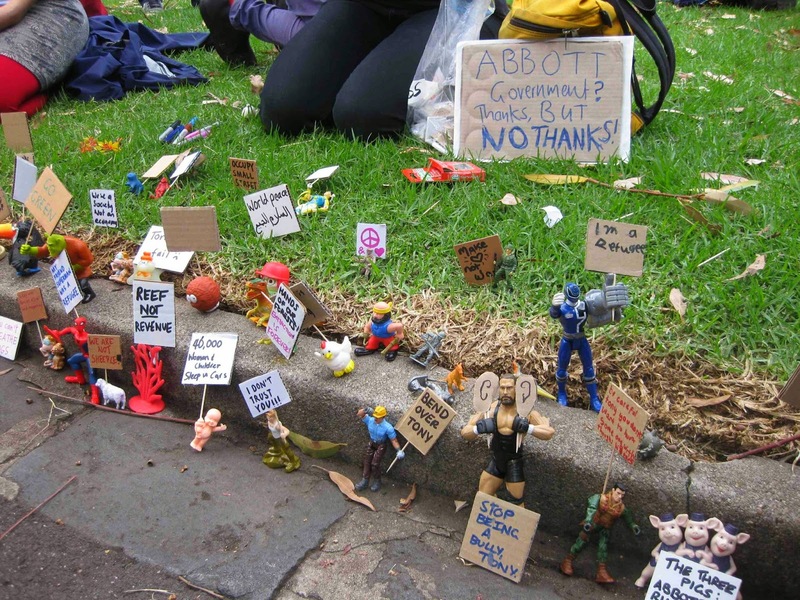 It was a protest against a government that was actually voted in by my fellow Australians, a government that is in the process of destroying everything so many of us still believe in. 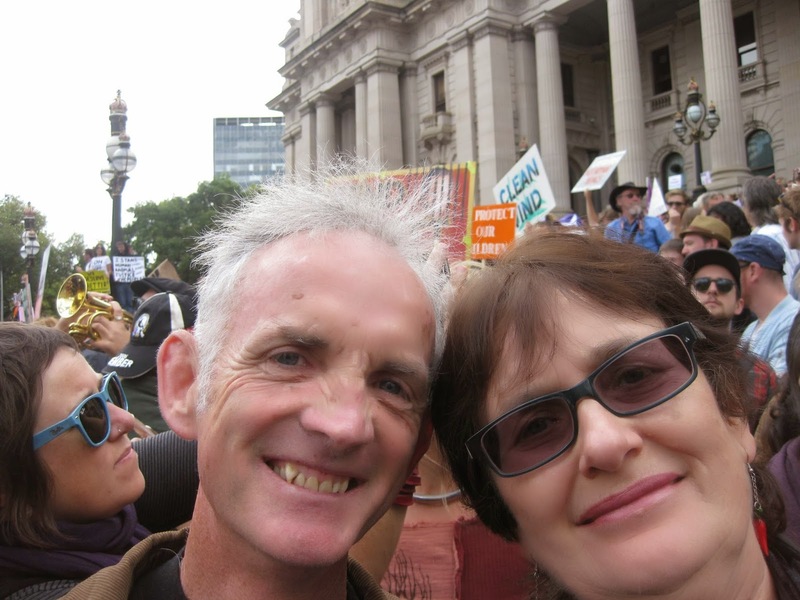 And so, so many of us were there yesterday: estimates vary from 30,000 - 50,000. 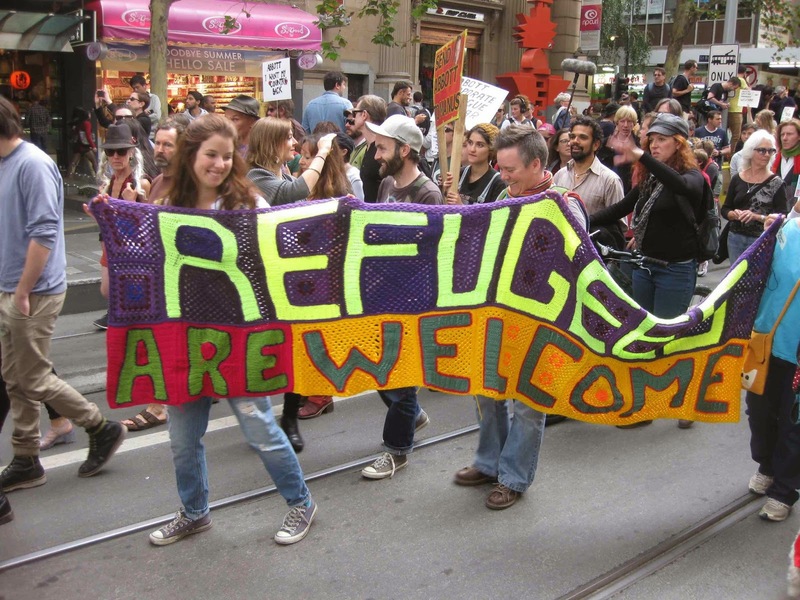 In the last three days similar marches have taken place all over the country. 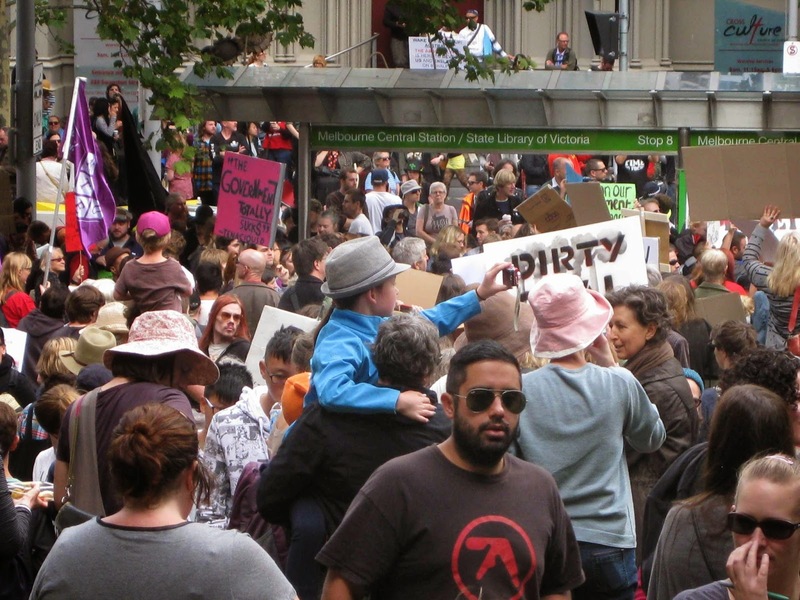 March in March began with a rally outside the State Library of Victoria. 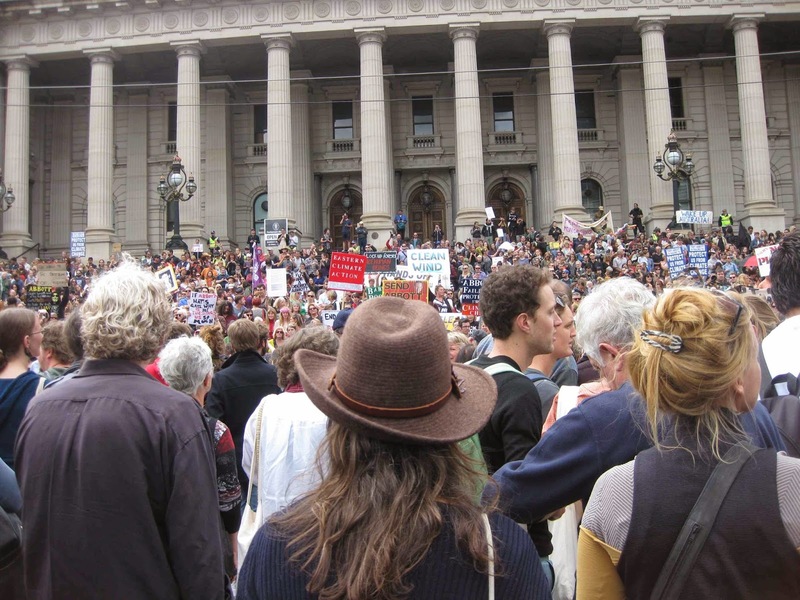 Afterwards the crowd marched from Swanston Street, turned left into Bourke Street and officially ended on the steps of Parliament House. These are a very small selection of around two hundred shots I took yesterday (including the shameless selfie of Shane and I directly below). We were both very proud to be there. 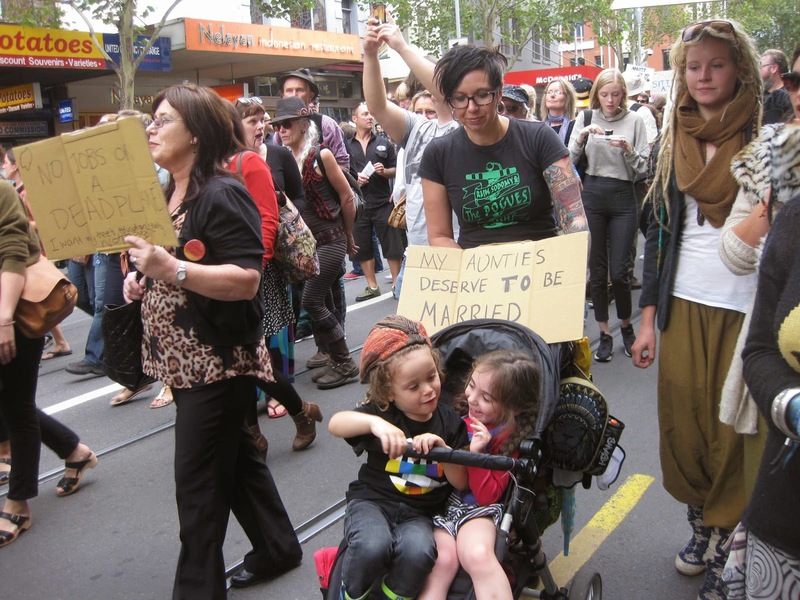 Lately we'd been feeling deeply ashamed to be Australian. 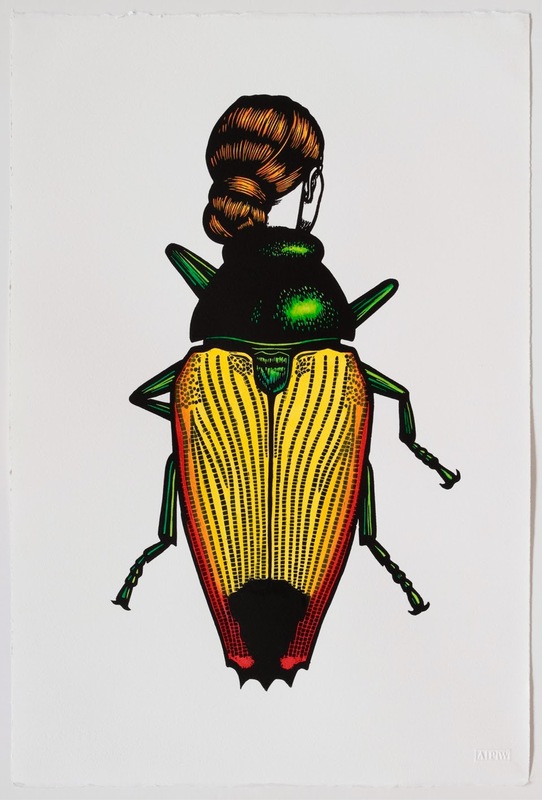 Most of the past week has been spent hand colouring the edition, plus various proofs (Artist Proofs, APW Proofs, Presentation Proof, Viewing Proof, etc) of the linocut Jewel Beetle Woman. It was a satisfying, pleasurable process, despite being rather more time consuming than I'd anticipated. As a rule, I hand colour with watercolours, but for the first time ever, I used pigmented drawing inks. The result was a far richer and more luminous surface. Based on past experience, I was wary of accidental drips and as a preventative measure cut stencils for two of the high risk areas: the body and hair. 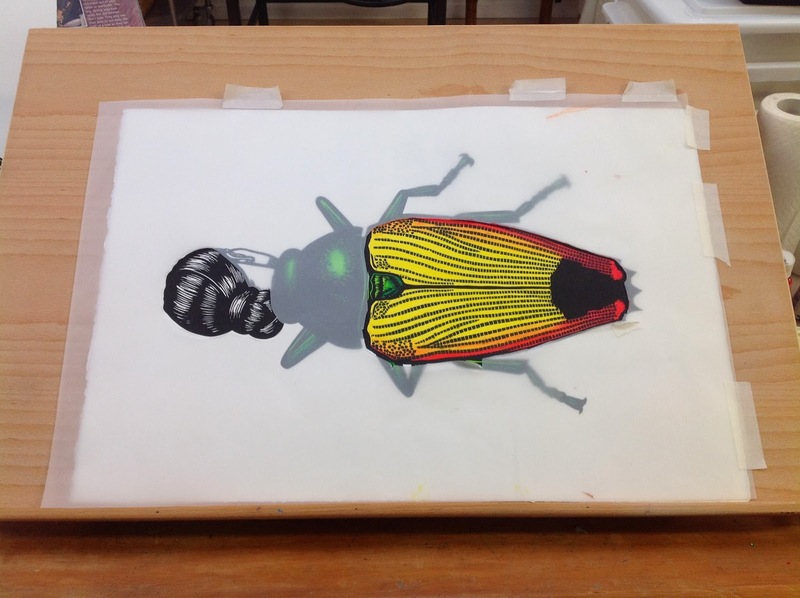 The greens of the beetle's upper body and legs were applied without benefit of stencils, but fortunately there were no mishaps. Today was a red letter day: the edition was delivered to the Australian Print Workshop, where it was numbered, titled, signed, dated and the relevant paperwork completed. As always, it was great to catch up with the folk at the APW. 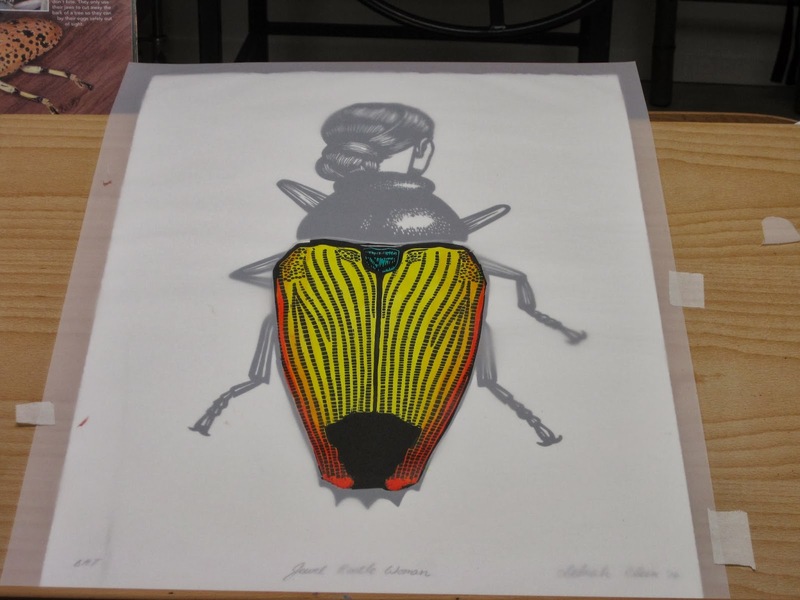 I've really appreciated their enthusiasm and encouragement throughout this project, particularly Simon White, who so expertly printed Jewel Beetle Woman. 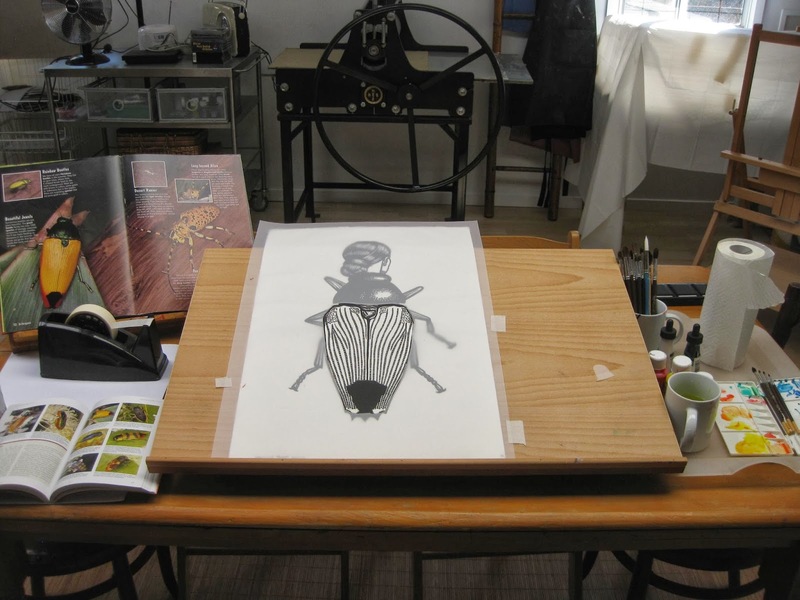 I was delighted that APW Director Anne Virgo picked up on the influence of the artist-naturalist Maria Sibylla Merian (1647-1717). 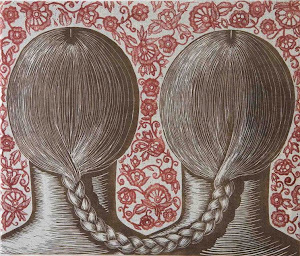 It turns out that not only does Anne share my deep admiration for this artist, she actually owns one of her exquisite hand coloured woodcuts.